I had an appointment in a nearby town yesterday. When I'm in another town, I think, "different thrift store..." So, after my appointment, I headed to this other town's Salvation Army Thrift Store. And it did not disappoint. I felt like it had a lot more interesting, unique items than our local Salvation Army Thrift Store. My theory is that the folks who make up the mix of people in a town look for different treasures at the thrift store than folks in other towns do. And they donate different treasures too. Does that make sense? 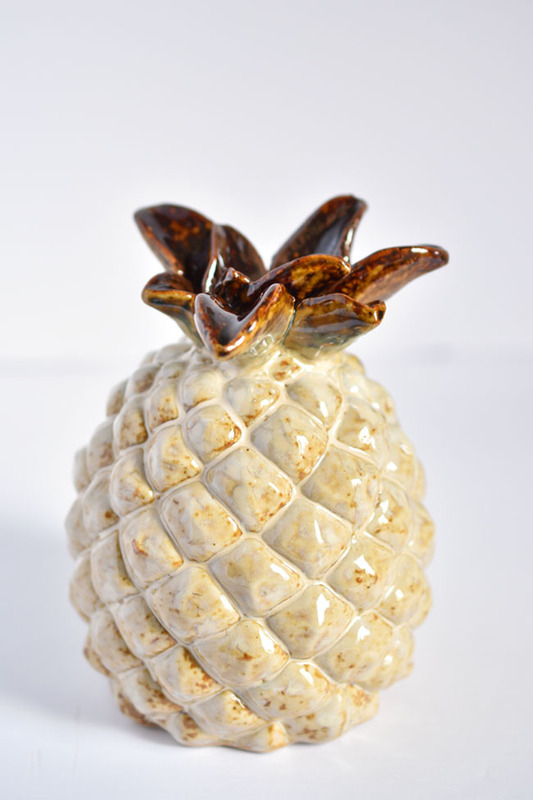 The first thing I spotted in the thrift store was this ceramic pineapple. "Heck yes," my inner shopper responded. "It's a pineapple." I mean pineapples are a trendy thing, right? And this would look so cute sitting on a little stack of books. 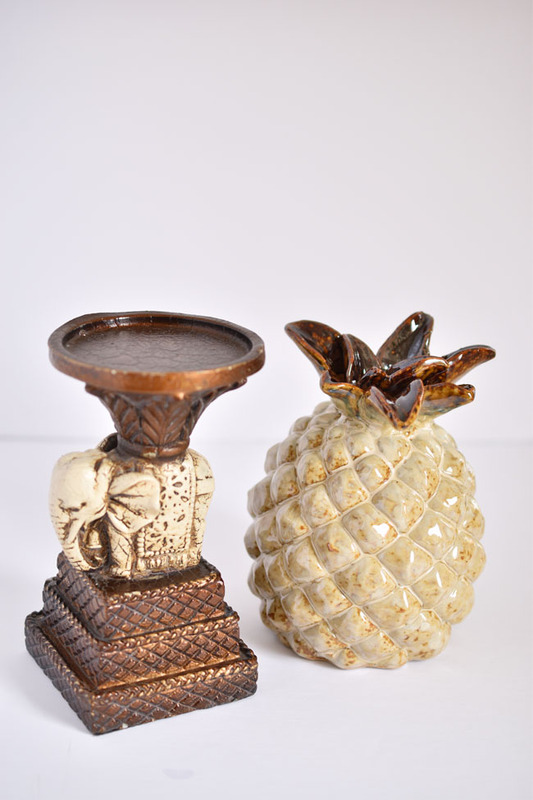 In the exact same colour scheme as the pineapple was this delightful elephant candleholder. "It's an elephant." That's another decor theme that can't be turned down, correct? 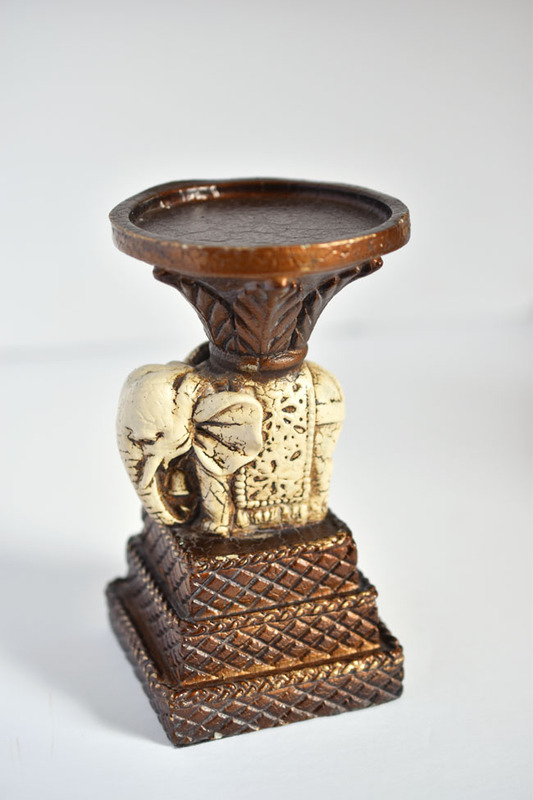 Plus this particular hardworking elephant carries your favourite pillar candle on his back! Each of these items was $4.99. I found several more items that I'll share at a later date. Spending $25 enabled me to use the $5 off coupon I got for donating goods. The cashier told me that my coupon was very old and that they now offer $10 off coupons. I think I knew that and forgot. Oh well, $5 off is better than $0 off. If you think you might have some Pinterest friends who would like to join our weekly Vintage Bliss Tuesdays party, I have created this handy pinnable image, above. Please do share. 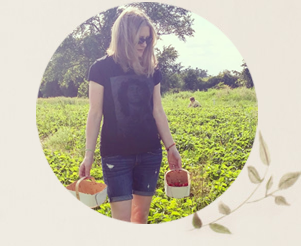 What themes do you look for (or not look for and buy anyway) when you are shopping thrift stores, garage sales and flea markets? It totally makes sense to me. LOL! The stores can be so very different from town to town. Some places I don't even bother to look as I never find anything there and other places, I always find lots of stuff. Hope you have a great week. I'm glad I make sense to somebody Dianne. Haha. Thank you. Thanks Joann, elephants and pineapple, great vintage combo.